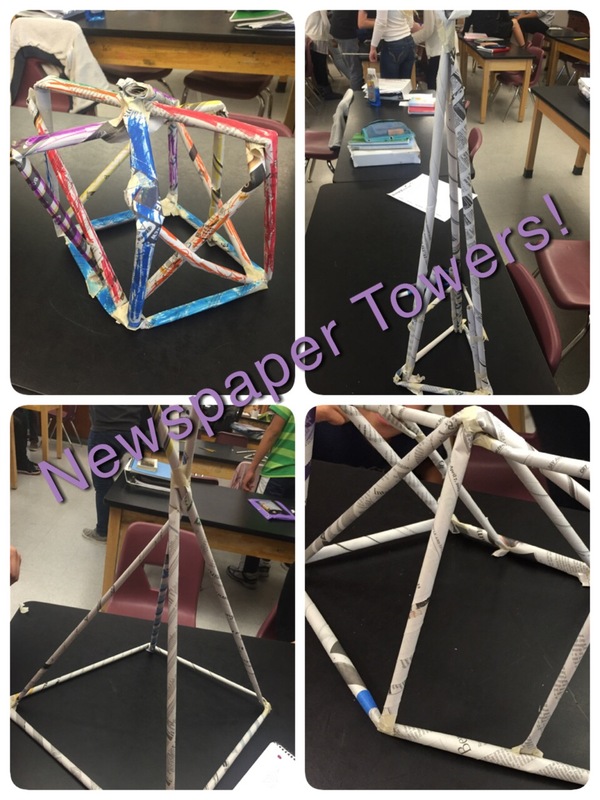 STEM activity 1: Newspaper towers! For these towers, the only prep work is collecting old newspapers and rolling them into dowels. It is a bit tedious; however, if you get students to help you before or after school, it’s not so bad! I gave mine classroom tickets as a thank you (read more about my ticket reward system in this post). 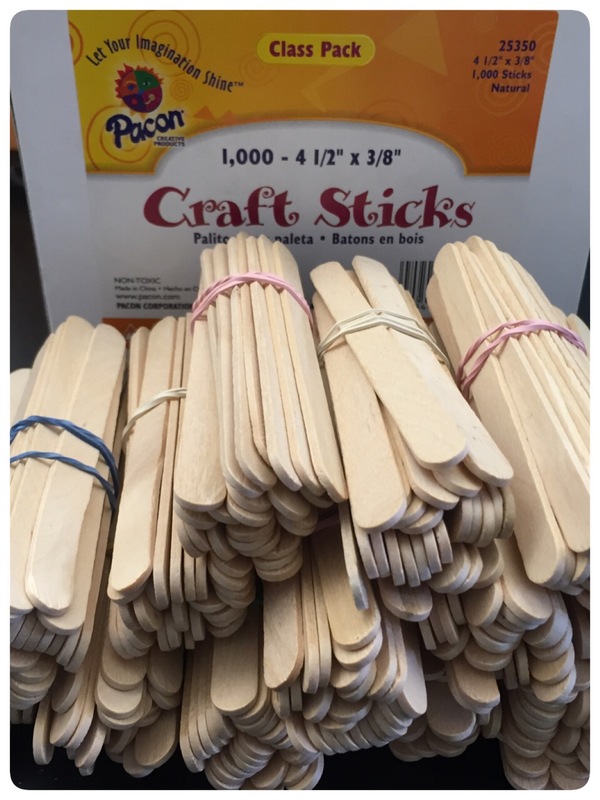 The only supplies students were given were: 7 newspaper dowels and two feet of painters tape. 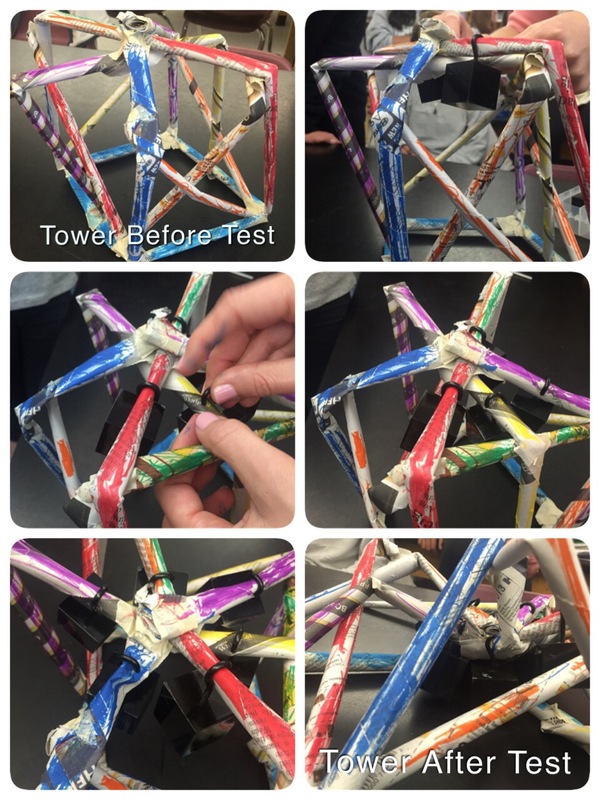 They were told that their “tower” needed to be a free standing structure (not taped to the table and not being braced by binders, etc.) and they were only allowed to use the supplies they were given. I did allow them to trade materials; they could trade in an unused dowel for five additional inches of tape or vise verse. Once completed, we had about 10 minutes left in class for their creations to be put to the test. Their height was measured as was their strength. 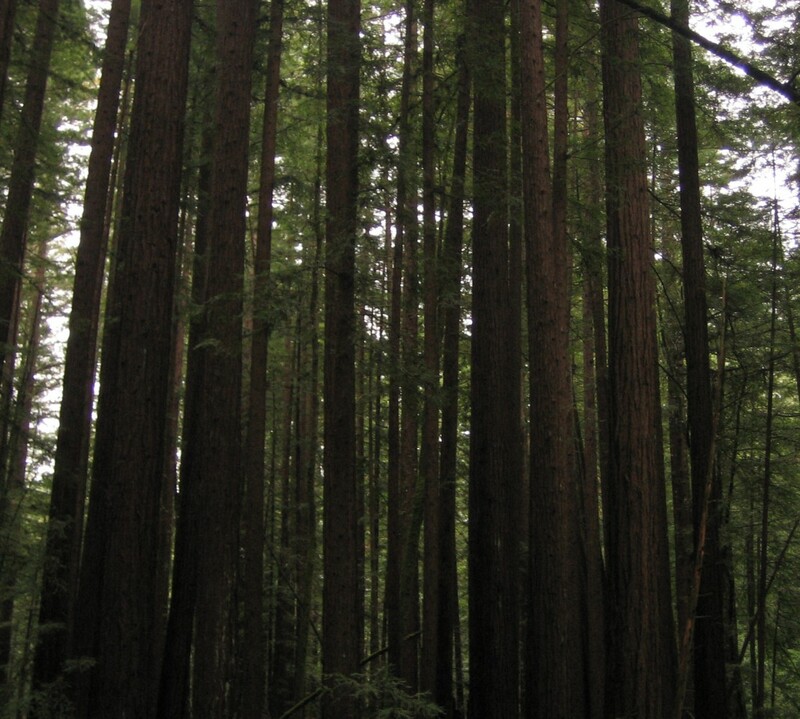 The tallest stood 2.5 meters tall (it was pretty weak). The strongest held 10 weights (approximately 5 lbs), very impressive! Here is one of them being tested for strength. It wasn’t our top “winner”, but it did well! 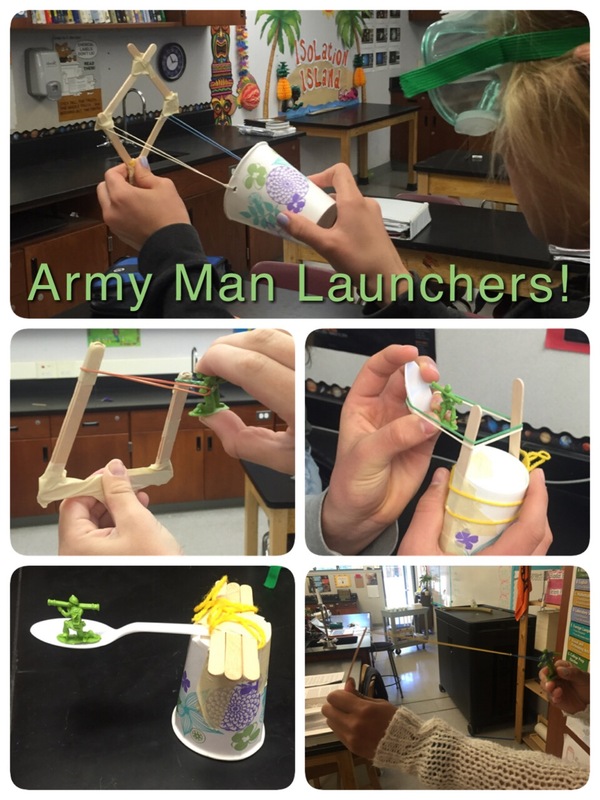 STEM activity 2: Army Man Launcher! For this activity, The setup was pretty simple–just buying the materials and getting them laid out. 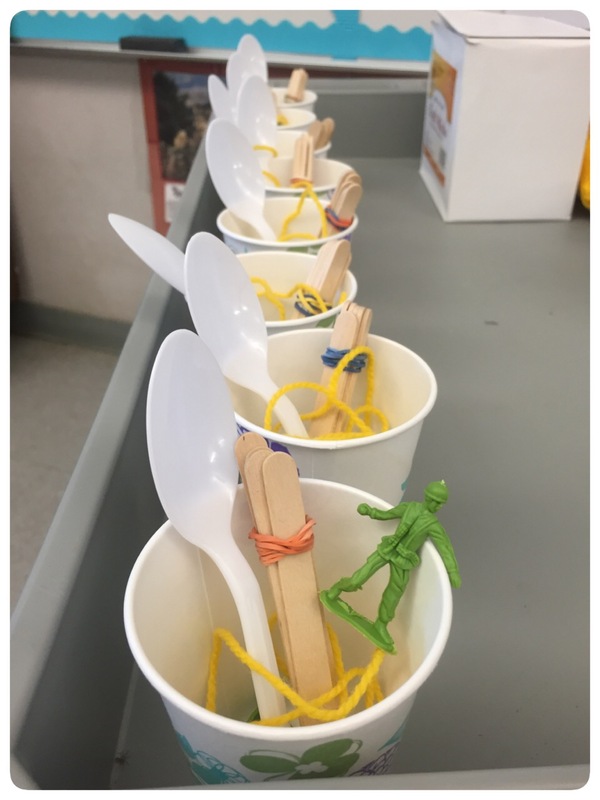 Students were given: one cup, one army man, one spoon, six Popsicle sticks, two rubber bands two feet of tape (they got the tape separately so it didn’t tangle) and two feet of string. They did not have to use all of the materials, but they did need to use at least 2. Students came up with some amazing ideas and we all had an absolute blast testing them out! After they field-tested their inventions, I took them outside and they lined up and launched all at the same time. The farthest of the day when over 20 feet! Very impressive! STEM activity 3: Popsicle Bridges! For this activity, the set-up was simple. I separated the students desks by 1 foot, gave each group 25 Popsicle sticks and 3 feet of tape. 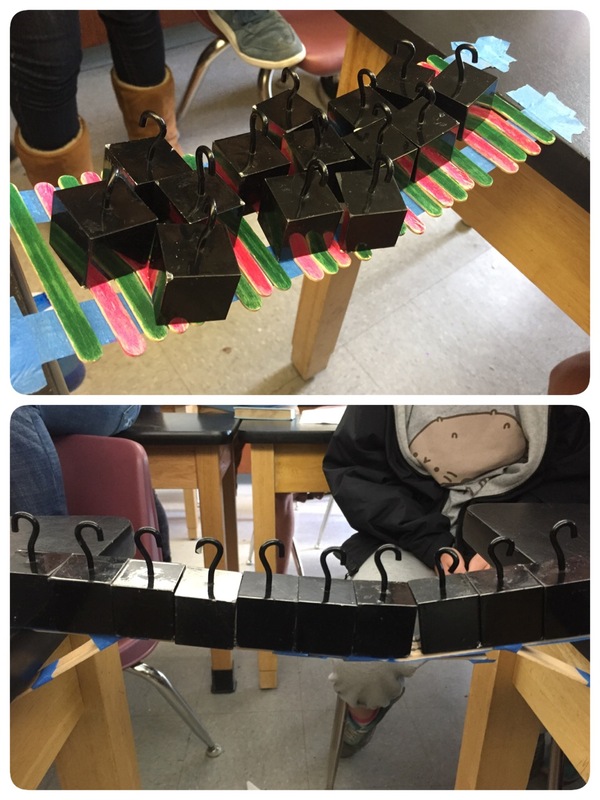 Their goal was to make the strongest and most aesthetically pleasing bridge across the great desk divide! (So, I guess because of the artistic component of this bridge, this challenge could be classified as STEAM rather than STEM). 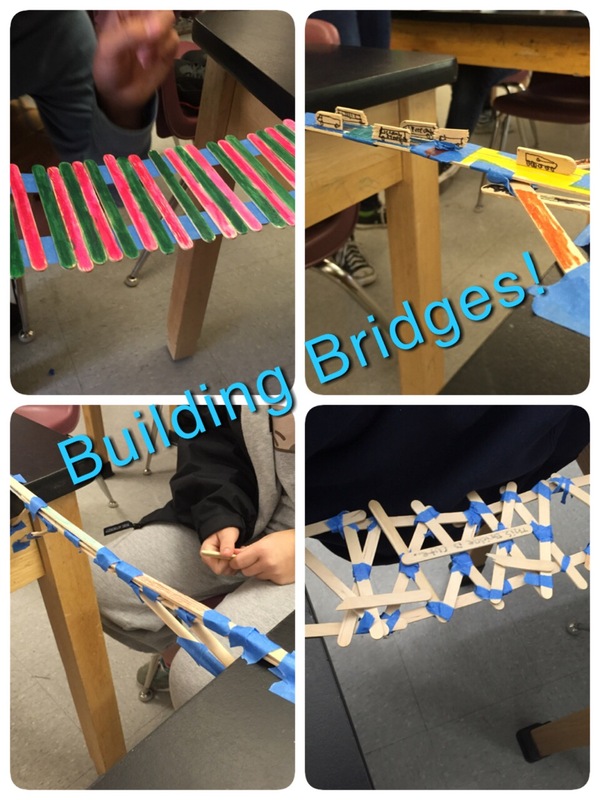 Some students initially grumbled about having to air their bridge nice looking; however, when I explained that this is a real issue addressed when bridges are built because people don’t want to look at an eye-sore, they want bridges to be beautiful! To test the strength of each bridge, I used the same half pound weights I tested the towers with. The winners of the day were able to hold between 5 and 7 pounds! Outstanding! 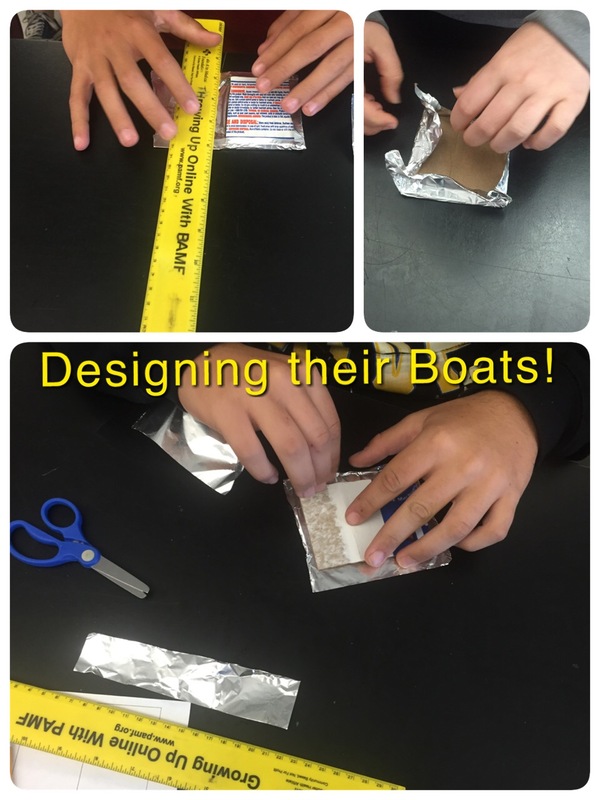 STEM activity 4: Designing Life Jackets for Babies! I adapted this idea from one of the NSTA magazines. 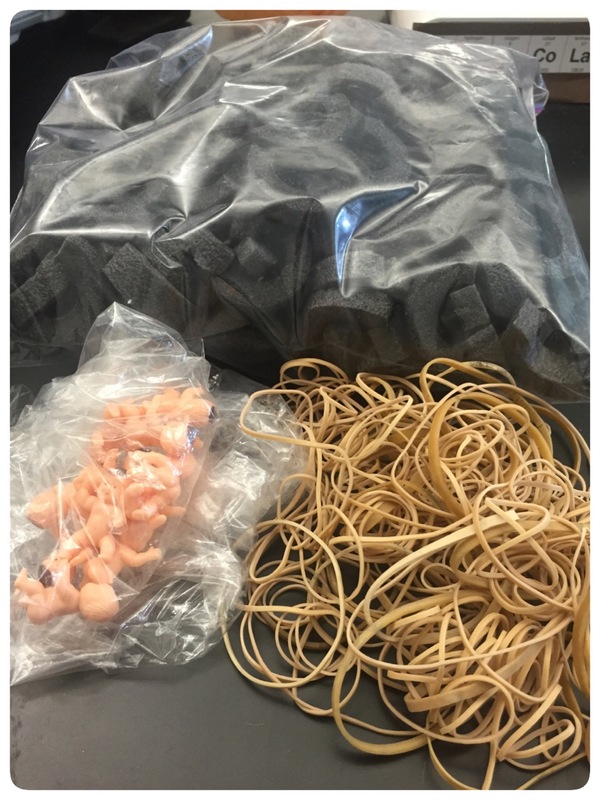 My adaptation uses: one rubber band, one plastic baby and one small peice of pipe insulation per students (This activity is cheap! The tiny babies came from a dollar store and were with the baby shower decorations and the pipe insulator was only $1.79). 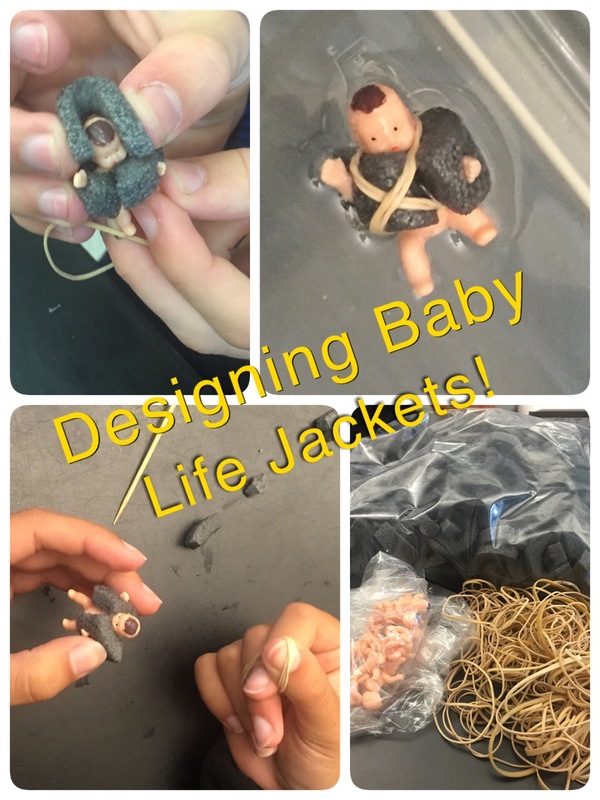 The idea for this activity is that students need to design a life jacket for a baby. The head must stay above water, no matter how it enters the water. In order to keep them from getting too silly with a water activity that involves miniature plastic babies, we discussed the importance of something like this and the need for safety. They took their task seriously, but still had fun with it! This was definitely much more challenging than they realized it would be. They spent the entire 40 minutes given to them trying to make it work. Many got very frustrated but then celebrated excessively when they finally figured it out. Overall, I would say they had fun with this one. This was the first individual task they had all week and they rose to the challenge. 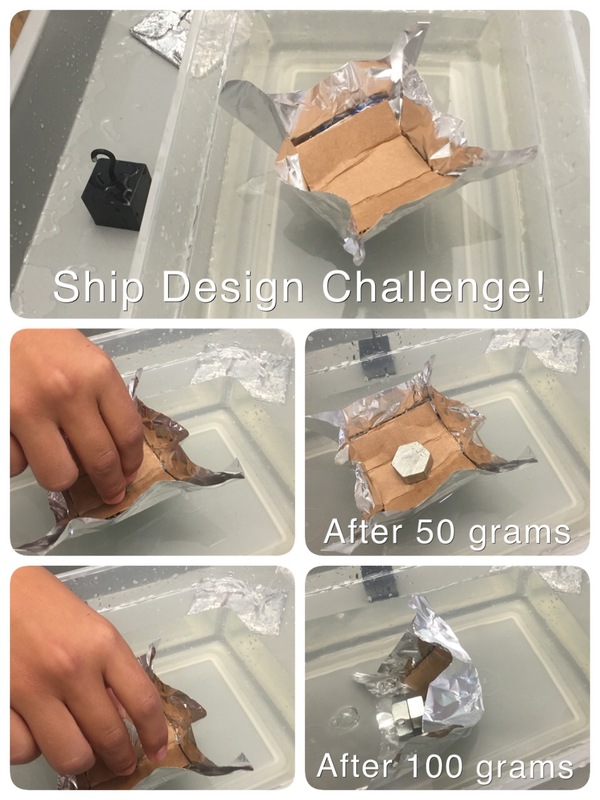 STEM activity #5: The Unsinkable Ship! The prep for this activity was fairly minimal. Each student got a 6×6 inch square of aluminum foil and about a 2×2 inch square of cardboard. Their goal: built/design a boat that could hold the most amount of mass before sinking. Overall, I was impressed by the focus and the variety of boats I saw. I was afraid by giving them cardboard I would see a lot of flat-bottom boats; however, this was not the case! Many of the boat designs varied greatly and they seemed interested in how theirs would stack up against the others. This week of STEM activities was astonishing to me. Not only did the students have fun, but they were so focused for every activity. Normally, I give lab sheets that they fill out as they go to keep them focused (typically these handouts include data tables, graphing, analysis questions and full written conclusions). For these activities I did not give handouts and they were just as focused without them. For some kind of follow-through, I did have them write about what they learned in their daily warm-up (what worked, what did not work, what they would do differently next time). I would highly suggest trying something like this in your classroom–allow them to play by giving a challenge and they will rise to the occasion, all while having fun learning! Want to try this in your classroom but don’t have the time to create the handouts? You can now purchase the entire week’s handouts as a bundle in my TpT store! Check it out! 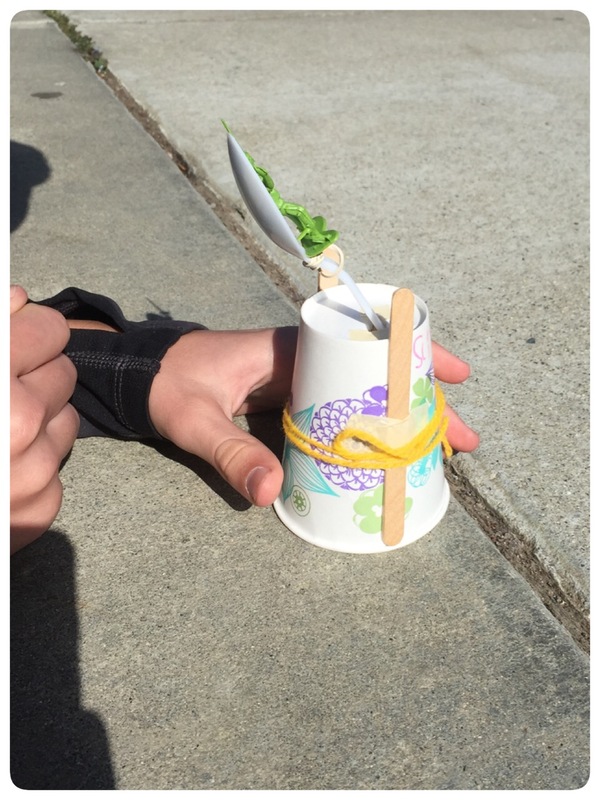 If you enjoyed reading this post, check out this other week long STEM project I did about the Crashworthiness of cars! I have been wanting to do the popsicle stick bridges for a while. And I know the newspaper idea would be a huge hit! Thanks! I am glad this inspired you! I hope you try these activities and that your students have as much as mine did!! Enjoy! For the newspaper dowels, I just took sheets from old newspapers and rolled them up. Start at one corner and slowly roll it towards the other end. A tight roll works best. ( I often ask my students to help me with this as it can improve their fine motor skills). I usually end up with two sizes: one for the full newspaper pages and one for the half pages. I only use one small piece of tape to secure it once I’m done rolling. You could also do some fun extension activities with the building and teach about seismic retrofitting and how to make buildings stronger. 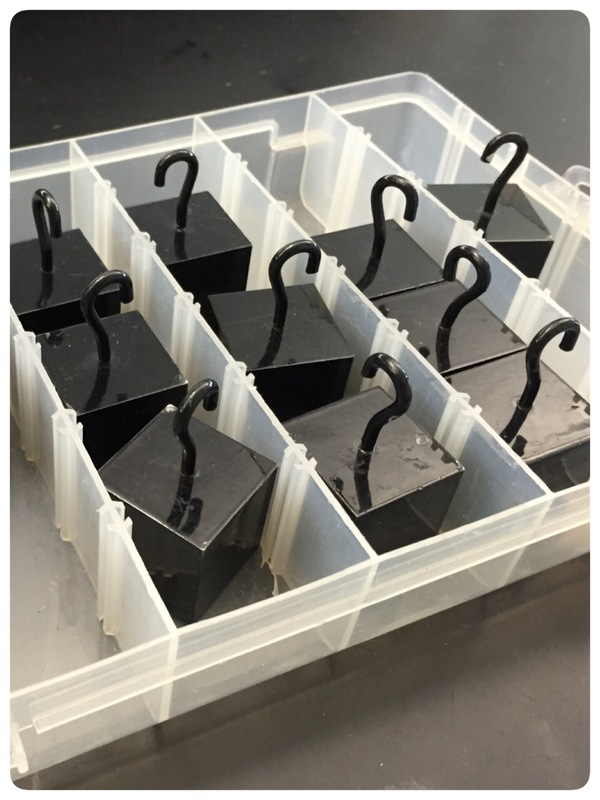 You could even build a “shake table” to test their creations! Good luck to you!! It sounds like you have a passion for working with these students and they are very lucky to have you! I’m the Academic Director for a branch of Boys & Girls Club of America, and I loved these ideas. I incorporated may of the lessons into our STEAM program! I love your site. It’s been so beneficial to getting our STEAM program on its fee! I am curious, however, to know where you got your hooked weight set. I have been looking everywhere for similar ones without any results. Please help! Hi Natalie, thanks so much for the comment! I am so glad to hear that my post has given you ideas for your own use with the Boys & Girls club! Unfortunately, I did not actually buy the weights (they were left by the previous teacher). I check on Frey Scientific and they sell a lot of various weight sets. I did not have time to look through all of the pages, but it appears that they have quite a few to choose from. They had replacement weights that were a bit heavier, but they are pricier. You could get a set with varying weights and start with the light and slowly build to heavier or vise versa. Just search for “hooked weights”, “weight sets” or “weights”. Where did you get the weights? Hi Desiree, unfortunately I did not buy the weights, they were left behind from the previous teacher. I just checked on Frey Scientific and they seem to have a lot of options there. I searched for “hooked weights”. Good luck! Just wondered what the pipe insulator stuff was that u used? Hi Danni, the pipe insulation is something you can buy at Home Depot, Lowes, Ace hardware or a similar store. Just ask a sales associate where the “pipe insulation”is and they will bring you right to it. I bought 6 foot segments and cut them in half. I remember them being a little less than 2 dollars each and I reuse them every year. Good luck and happy STEM-ming! Hi Danelle, I teach 8th grade. These activities can easily be done with younger or older students. For older, give more restrictions and have them do calculations. For younger, give them less restrictions and perhaps some more guidance depending on how young they are. Good luck! Is there a book where you got these projects? I’d really like to get copies of materials/projects to add to my science fun day projects binder. Is there a book that you used for these projects? I’d like to add the to my science fun day binder! Hi Laura, what a great question! I was inspired by various ideas I had seen online, but I came up with these on my own. I am in the process of creating worksheets and documents to add to my TpT page. So, be sure to check back in a few weeks for the link on this post! Guess what, Laura… the worksheets are finally available at my TpT store. I put a link at the bottom of the post. Happy shopping! Wow!! What a complement coming from such an experienced teacher! Thank you so much for your kind words. 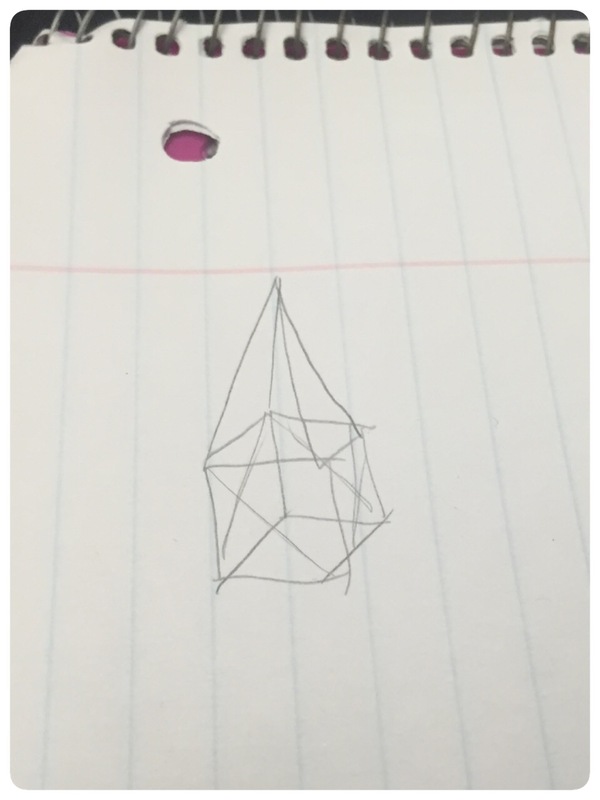 I am so glad that you were inspired by my post and had a chance to try these ideas out with your students! I love this post! I am looking for the tiny babies and having some trouble. Any specific store I should look in? I found some at Joann’s that say they are an inch long. I’m very excited to try all of these with my 8th grade Girl Scouts as part of my STEM camp out. I love the variety of group and individual experiments! My 5th graders will make bridges this week! I have two questions: 1. How many students were in each group? 2. For the bridges, did you use blue painter’s tape or masking tape?? I appreciate you posting these! I am so glad you are inspired by this post! I had groups made with 4 students each and I used blue painters tape. Have fun and let me know how it goes!! I hope you have fun doing it!! Enjoy! I love all the activities. Thank you so much for sharing. I have a question. How old are your students? I have really young students (3-6) Im sure the 6 year olds can work on this, but Im not sure about my 4 year olds. What do you think? You are very welcome! I am so glad that you are inspired by my ideas :) The beauty with these mini-projects is that they can really accommodate any age group, you just either have to add or take away. For the younger ones, you will want to scaffold a lot more so they don’t get frustrated. I would suggest having different versions of things prebuilt. They can examine them and hypothesize which will work better and five explanations as to why. Then, they can test them all out and discover the answer! They could also take what they learned and build their own version for an extension. So, for example, you could build a few different bridges for them to examine and test. Or a few different catapults. Great ideas! Thank you so much! I have a STEM/Power/Enrichment class this year in addition to my regular math classes. I’ll see all my seventh graders for a quarter each – these look like some great things to do in that class. What a fun class! You and your students are lucky to have something like that at your school! I really hope you all enjoy these activities! I k ow my students always do! Be sure to also check out my activity from this year designing paper cars for crash tests and safety. It was a big hit! I was wondering where you found your weighted hooks. I’ve looked everywhere and am not able to find them. The hook is very convienient. Hi Tammy, unfortunately I did not buy the weights, they were left behind from the previous teacher. I just checked on Frey Scientific and they seem to have a lot of options there. I searched for “hooked weights”. You could also check other supply companies such as Glenco, Carolina or Flinn. Good luck! I would also know where you found the weights with the hooks. I have a number of activities that I could use them for. Thanks for all the awesome ideas! Can’t wait to try them out this year! Hi Joyce, unfortunately I did not buy the weights, they were left behind from the previous teacher. I just checked on Frey Scientific and they seem to have a lot of options there. I searched for “hooked weights”. You could also check other supply companies such as Glenco, Carolina or Flinn. Good luck! I want to complete these activities and buy the worksheet packet…but I don’t know where to purchase the weights for testing the different projects. unfortunately I did not buy the weights, they were left behind from the previous teacher. I just checked on Frey Scientific and they seem to have a lot of options there. I searched for “hooked weights”. You could also check other supply companies such as Glenco, Carolina or Flinn. Good luck! I hope you still try the activities! They are super fun! You may just have to get creative with that “weight” you put on the bridges. Enjoy!! Looking into these companies for similar weights. Thank you! Your weights all look the same size? Are they? How heavy are they? They are all the same size and each one was about 1lb :) good luck! Maybe I missed it–this is a long list to read on my phone–but did you talk about your reward ticket system? You mentioned you would. I have a new STEM:Builder elective for 7th-8th where I have them 1 hour, once a week. Can’t wait to try LOTS of your activities. For this grade level, what time would you suggest allotting? Do you give them any background info on the science, either before or after the activity, or just let them explore, build, and have fun (which since I don’t need to grade this elective, I’m all for the explore, build and have fun!) Plus all my classes are 95% boys, so we’ll need to stay very active! I gave them about and hour for each of these activities (and I’m sure they would have loved having a second hour to then try again after seeing everyone else’s ideas). I would definitely suggest not giving them information until after. Use these activities as hooks to get them interested in the topic. Then, after they have learned by experience, let them learn formally–that way, they will be able to look back on their own experience and feel a stronger connection to the topic at hand. I would do a balance of “fun exploration” and extended learning. Listen to them, if they are asking questions like “why did that one work better” etc, then take that as a signal that they want to learn more. Perfect, thanks! Can’t wait to get started this week! Well, after googling hanging weights and learning what some men do with them (very unscientific I’m sure!) I decided to stop googling hanging weights! I brainstormed around my kitchen and think that taking a small plastic water bottle, poking holes in the lid or bottle, filling it up with something heavy I have around (like marbles) and then using some heavy copper wire to make the hook through the holes. Might have to make them lighter and more, but I think I can make something work. Will just have to dream about the nice, uniform ones in the pictures! I love your creativity! You could also buy fishing weights and tie them together using string and “hang” them over the bridges. Good luck! Hi there! I absolutely love your newpaper tower ideas. 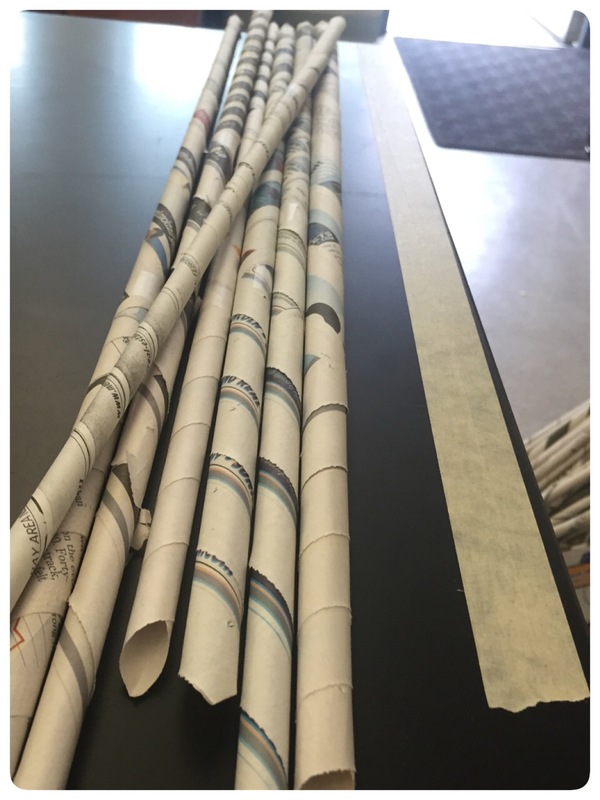 I was wondering how long you made your newspaper dowels and if they are made of one sheet of newspaper or multiple sheets? I’m hoping to implement this in my classroom next week! Thanks! Thanks! They were all varying in size based on the piece of newspaper. The big sheets create longer dowels than the half sheet. I only used one sheet per dowel. Good luck! I hope you and your students enjoy the activity! These are wonderful! Thank you so much! I am a beginning teacher and need all the tips like this I can find. I am so happy to help! You should check out teachers pay teachers- there are so many great resources on there, many of which are free! No need to reinvent the wheel! Good luck to you!